Today, India’s hyper-connected consumers are rapidly entering an era where they expect retailers to provide consistent and unparalleled service across all touchpoints. From choosing between various channels to being channel agnostic, the Indian consumer has come a long way and is now fast moving towards the omnichannel way of life, according to PwC’s annual retail survey 2016. In this blog, we will discuss in detail about 5 retail brands that are going the omnichannel way in India. Premium lifestyle brand for professionals, Van Heusen, recently unveiled its first digitally immersive flagship store, in their effort to address every customer’s pet peeve of not finding the appropriate fit, size and style best suited to their personality. At the store, shoppers are greeted by a 42 inch, digital display called ‘Today’s Briefing’ that offers ‘look of the day,’ informs what’s new in-store, doles out styling tips and updates on new fashion trends. Next to the display is the ‘Fit Scanner’ enclosure, where the customer is scanned by an infrared device, after which, measurements, right from the collar circumference, shoulder width, to the chest, bust, hip etc are generated and are used to identify the right fit for shirts, trousers, dresses, etc. Adding on to that, the store also has a ‘Style Bar’ digital display that helps customers to identify their style personality by answering a few questions and throwing up 20 different looks that match the shopper’s style. Customers can even choose to virtually preview the selected shirts , trousers etc, on themselves using the Virtual Trial Mirror, without having to step into a physical trial room. By offering such wide array of digital solutions, the store aims to solve customer issues of fit and fashion through multiple digital touchpoints. Being a country that is yet to have Victoria’s Secret stores, the idea behind a fitting lounge is still new in India. Adding on to that, established brands typically do not offer anything to educate their customers on how to get measured or go about buying lingerie. Aiming to fill this void, online lingerie retailer, Zivame, recently launched its first flagship fitting lounge in Bangalore, to help women make educated choices in their purchases going forward. Customers can just walk in and enter their details on a tab. The professional fitters at the lounge then go on to help them discover their right size and also provide expert advice when it comes to the style and type of options available in the market. If convinced, the lounge also allows customers to make an online purchase right then and there. Thus the fitting lounge is aimed at providing customers a perfect touch-and-feel experience that will complement the online store, rather than announcing Zivame’s foray into the offline market. The company plans to open such stores across the leading metro and Tier 1 cities in the country by the end of 2016. Shopping for furniture can often end up being a very a complex process especially, for millennial customers setting-up homes for the first-time. These customers seek the best in terms of quality without compromising on their busy lifestyle and packed schedules. In their efforts to allow customers to interact and consult with interior designers and architects with ease, leading online furniture retailer, Pepperfry, launched its concept store ‘Studio Pepperfry’. The interior design consultants at the studio, equipped with in-depth knowledge of the Pepperfry furniture portfolio, can easily take customers through the various designs showcased at the Studio and the extended online Pepperfry range, to help them choose furniture that suits their individual tastes and preferences. Adding on to that, the studio also offers customers the advantage of availing services ranging from customization to advisory related to design and other helpful tips, enabling them to make the right purchase decision. Once a customer zeros-down on a particular piece of furniture at the studio, he or she can easily place his/her order online. As of date, 10-15% of Pepperfry’s sales come through such studios. In their efforts to continue growth in this direction, the online furniture brand is all set to supplement the current six studios by launching four more such experience-zones by March next year. In their attempt to find a connect with a younger audience, Raymond’s recently launched a new flagship store in Bangalore that boasts of a double height ‘live’ façade with LED curtains displaying digital content. Just as in the case of Van Heusen, this store too comes with a unique fitting room experience which allows a customer to click ‘Trial’ on the iPad and have his selection appear in the desired size inside the trial room. Adding on to that the store is designed to sell apparel only via an iPad. So far, the store has generated higher than average footfalls. The store was launched last year and the company plans to open 15-20 more such stores in the next one year. Keen to cash in on the online shopping boom, the Adidas Group, launched their 1st Indian omni-channel store in New Delhi last May. This was soon followed up by the introduction of endless-aisle technology in Chandigarh and the brand currently aims to integrate 200 of its stores with this technology by the end of this month. This endless-aisle technology allows consumers to browse, research and pick up their products with convenience. Adding on to that, it also allows the retailer to sell products that are not available in stores and at the same time service orders received from the Adidas Web store. As a part of their omni-channel program, the brand recently launched Adidas Neo which is a brand that is targeted at the youth segment and is currently only available on the online platform. Through this initiative Adidas aims to grow their product range by introducing niche products such as cycling equipment. Ideally these items would take up a lot of space in traditional stores, so Adidas plans to wait till they gain traction before displaying them in store. When armed with the right tools and technologies, store associates can act as credible brand ambassadors who can drive customer loyalty while improving customer retention. This can be done by equipping the store associate with data on products available across different distribution channels and access to meaningful insights on her customer in order to offer a personalized experience. 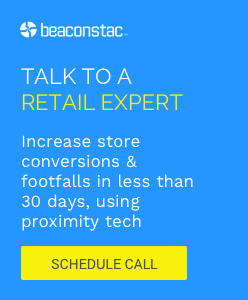 Technologies such as beacons, that can provide data that deliver a 360-degree view on customers, enterprise-level inventory data, and in-built intelligence to provide the right recommendations (product recommendations, substitutes, alternate fulfillment options, dynamic offers) are critical for associate empowerment. When it comes to creating personalized content, it is highly critical that retailers understand the context of their customer and tailor messages accordingly. To ensure this, you need to gather information from several touch points, both offline and online and match the content to the overall buying cycle. And no technology does this better than beacons. For example, say a customer is detected to be standing in the houseware department, right next to the display of Coffee/Espresso Makers. You can use beacons to push product demo videos that will educate the customer on the brewing flexibility of the Coffee Maker, thus helping them make the right decision. Also, if you are interested in a more comprehensive analysis that includes an in-depth industry map that outlines key players in the Indian mobile commerce landscape, download our complete report: India’s m-commerce landscape in 2016’. Are there any other interesting examples of brands that have taken to omnichannel retailing in India? Let us know in the comments below.